Today marks the 6th anniversary of the Boxing Day Tsunami of December 2004. The occasion is being marked solemnly in many locations hit by the waves all along the Indian Ocean rim countries. 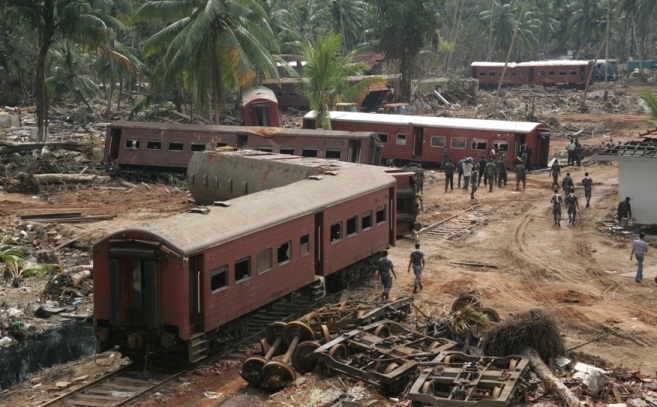 Among them is Peraliya, close to Telwatte, where the worst train crash in railroad history occurred that day — when an overcrowded passenger train was destroyed on a coastal railway in Sri Lanka by the tsunami. The government-owned Sri Lanka Railways will never be able to live down their day of infamy when a packed train headed to disaster with no warning… They have the gumption — and insensitivity — to operate a memorial train today along the same path that led more than 2,000 passengers to a watery grave six years ago. After six years, most survivors have moved on and rebuilt their shattered lives. Memories are also beginning to fade a bit, but for those directly affected, they will remember 26 December 2004 for the rest of their lives. And we who shared their tragedy and misery will keep reliving the memories through photographs, videos and the growing body of creative writing that the region-wide disaster inspired. Photographs stand out as possibly the most enduring memory aids of a disaster. As disaster survivors sift through what is left of their homes, family photo albums are among the most cherished possessions they seek to recover. Why are snapshots of frozen moments so powerfully evocative to individuals, communities and the world? I posed this question in the introductory blurb I wrote for my friend Shahidul Alam‘s chapter on disasters and photography in our 2007 book, Communicating Disasters: An Asia Pacific Resource Book. 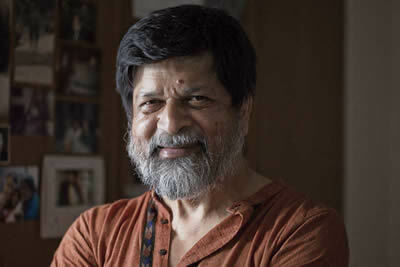 Titled Capturing Nature’s Fury, the chapter drew on Shahidul’s experiences not only with the tsunami, which he covered in Sri Lanka, but also the earthquakes in Bam, Iran (December 2003) and Kashmir (October 2005), and cyclones and floods in his native Bangladesh. “I had seen it before. As people rummaged through the ruins of their homes, the first thing they searched for was photographs. Years earlier at a disaster closer to home, I had photographed a group of children amidst the floods of 1988. The children insisted on being photographed. As I pressed the shutter, I realised that the boy in the middle was blind. He would never see the photograph he was proudly posing for. Why was it so important for the blind boy to be photographed? “Though my entry into photography had been through a happy accident, my choice of becoming a photographer had been a very conscious one. Having felt the power of the image I recognised its ability to move people. The immediacy of an iconic image, its ability to engage with the viewer, its intimacy, the universality of its language, means it is at once a language of the masses, but also the key that can open doors. “For both the gatekeepers and the public, the image has a visceral quality that is both raw and delicate. It can move people to laughter and to tears and can touch people at many levels. The iconic image lingers, long after the moment has gone. We are the witnesses of our times and the historians of our ages. We are the collective memories of our communities. The train’s many tons of steel were no match for the enormous seismic energy that the sea waves were transmitting that day. There is no precise estimate of how many people perished on that train, ironically named Samudra Devi (Queen of the Sea) on the morning of 26 December 2004. The estimate ranges between 1,500 and 2,500 – some bodies were never recovered and washed into the sea. 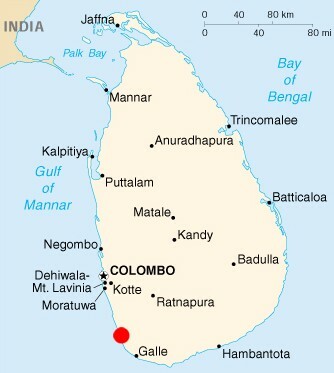 They joined a total of nearly 40,000 people dead or missing in Sri Lanka. My friend Chanuka Wattegama, engineer turned ICT researcher, has done a detailed analysis of how and why no early warnings were issued anywhere in Sri Lanka that day, thus allowing many preventable deaths to occur. The tsunami, though extremely forceful, impacted only coastal areas and rapid evacuation could certainly have saved lives. He summed up his findings in a chapter on the subject he wrote for Communicating Disasters: An Asia Pacific Resource Book that I co-edited with Frederick Noronha two years ago. “The railway authorities realise that one of their trains is moving down south, towards a risk prone area. They attempt to call the railway stations en route. The train is parked at the Ambalangoda railway station, when the station master’s phone rings constantly. Nobody answers it. Both the station master and his deputy are busy supervising the unloading of some goods from the train. By the time they receive the message, the train had already left the station. They do not have any way of issuing a warning, as the engine drive does not have a mobile phone.